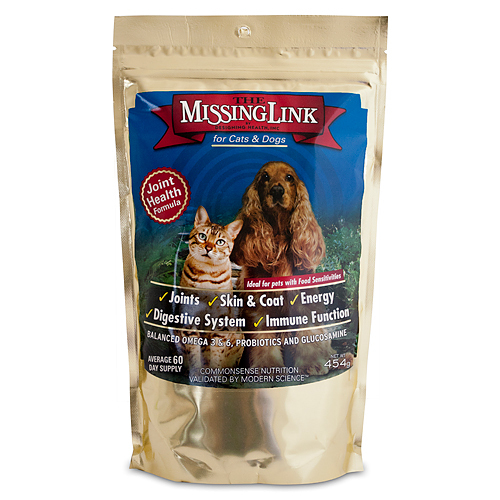 The Missing Link - For Cats and Dogs provides the ideal balance of all important Omega 3 and 6, fibre and phytonutrients that are nutrient dense in addition to vitamins & probiotics. With added Glucosamine for joint health. Designed for older pets, or breeds that are more susceptible to joint issues. Balanced Omega 3 & 6 essential fatty acids to maintain healthy skin and coat. Omega 3 & 6 essential fatty acids nutritionally support - intercellular health, energy levels, the immune system and muscle, tendon and ligament function. Probiotics and dietary fibre to promote a healthy digestive system. Glucosamine HCL for healthy joints. Cold pressed method ensures the freshest delivery of Omega 3, fibre and phytonutrients. This gives your pet the best support for a healthy skin and coat, healthy digestive and immune function, with sustained energy. Gut flora stabiliser: Dried Lactobacillus Acidophilus Fermentation Product 380mg (Probiotic). Ground Flaxseed, Rice Bran, Primary Dried Yeast, Cane Molasses, Sunflower Seeds, Dehydrated Alfalfa Meal, Dried Carrot, Ground Barley Grass, Dried Kelp, Garlic. Add The Missing Link to your pet`s diet according to its weight. Due to the high flibre content, start with small amounts and gradually increase to the recommended level over the course of a week or two. This 454g bag is approximately a 2 month supply for an average sized animal (18 - 36kg dog). Below are reviews of The Missing Link For Cats and Dogs Plus - Joints - 454g by bodykind customers. If you have tried this product we'd love to hear what you think so please leave a review. I've been giving this to my 16 year old dog, mixed with her food and she loves it! The difference in her joints is amazing, she can even jump on the sofa again! The Missing Link For Cats and Dogs Plus provides the ideal balance of all important Omega 3 and 6, fibre and phytonutrients with added Glucosamine for joint health. Designed for older pets, or breeds that are more susceptible to joint issues.